It’s about time for some sizzling, comforting stew, isn’t it? 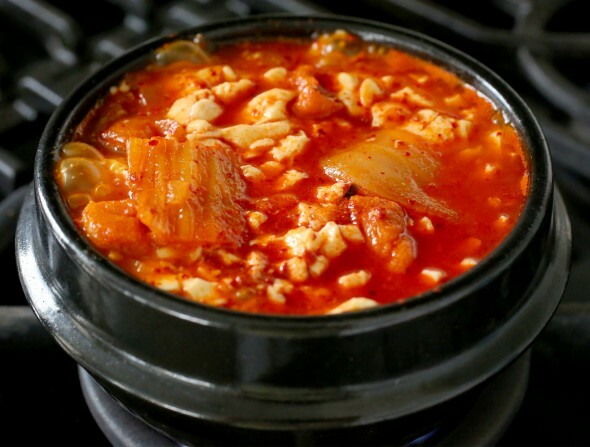 How about sundubu-jjigae? 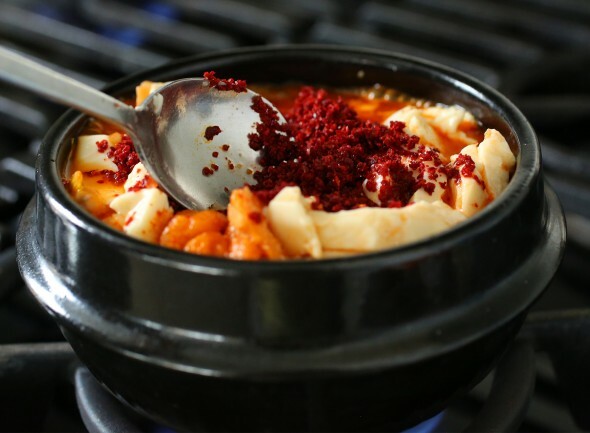 It’s hot, spicy, filling, comforting, delicious, soft tofu stew and has many reasons to be one of the most popular items in Korean restaurants. 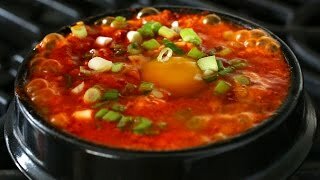 I made a video and recipe for sundubu-jjigae seven years ago (!) and it’s been watched over a million times on YouTube (!!). So it was about time for an HD remake and a variation on the recipe, too. That recipe was for seafood sundubu-jjigae, which is my favorite, but since then I’ve learned that kimchi-sundubu-jjigae is more popular. This recipe is is for that version, it’s sundubu-jjigae made with kimchi and pork belly, really hard to go wrong with this dish. Whichever one you choose, you won’t be disappointed. Both are delicious, spicy, and savory, much better than anything you can order at a restaurant. This recipe serves 1 or two people, but you can double or triple the recipe for more people, and use a large stainless steel or cast iron pot for the cooking. If you want to serve everyone in a ttukbaegi then you’ll need to cook them on multiple burners, just like a restaurant! Enjoy my recipe, and let me know if you make this! Take a photo and send it to me! Put dried anchovies, radish, dried kelp, and 4 cups of water in a pot. Cover and boil over medium high heat for 10 minutes until it starts boiling. Remove from the heat and strain. It will make about 2 cups of stock. Combine the hot pepper flakes and the sesame oil in a small bowl and mix well. Heat up a 3 cup earthenware pot (ttukbaegi) on the stove over medium high heat for about 3 to 4 minutes. If you use a small heavy pan or pot, it will take less. Add the vegetable oil, onion, and garlic. Stir it with a wooden spoon for 1 minute. Add the pork. Stir for 3 minutes until the pork is no longer pink. Add kimchi and keep stirring for a minute. Add ½ cup anchovy stock. Cover and cook for 7 minutes over medium heat. Add the salt and the sugar and mix well. 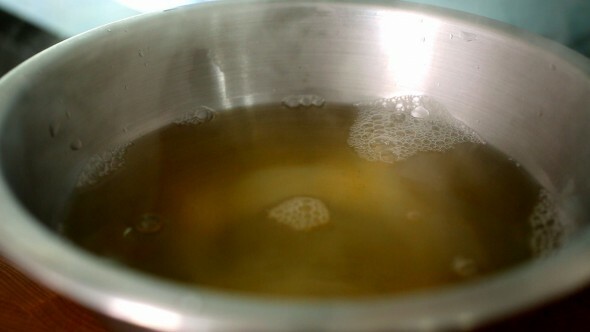 Cut the tube of soft tofu into half and squeeze it out into the pot. Gently break up the tofu with a wooden spoon. If you want, add a few tablespoons of stock. Put the hot pepper mixture on top and spread it with the spoon. Crack the egg and put it on top, in the center of the stew. Let it bubble and sizzle for 1 minute. 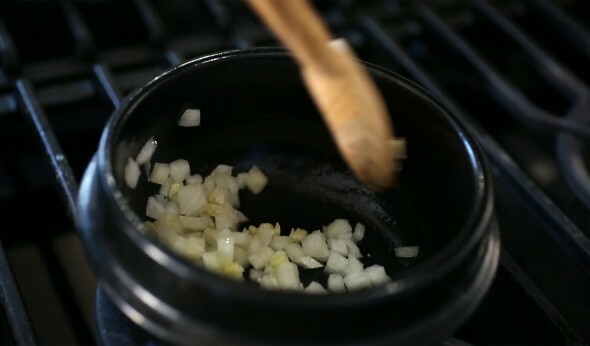 Sprinkle with the chopped green onion and serve with rice and a few more side dishes. Posted on Monday, January 26th, 2015 at 12:46 pm. Last updated on September 29, 2017. Posted March 18th, 2019 at 6:53 am | Log in to reply. Posted February 20th, 2019 at 7:57 pm | Log in to reply. I have been meaning to post a picture for quite a while now. I started making this recipe about 2 and a half ago. It was one of the first recipes I made of Korean food and now I am in love with Korean food and cook it all the time. Thank you for being such a great Korean cook and Korean cooking teacher. I watch all your videos and have all your books. I would love to meet you one day. Do you ever do appearances or book signings at New York bookstores? Posted February 27th, 2019 at 9:14 am | Log in to reply. It looks very tasty! I’d like to meet you someday, too! Posted January 30th, 2019 at 2:42 pm | Log in to reply. This was absolutely the best soon dubu I have ever had. 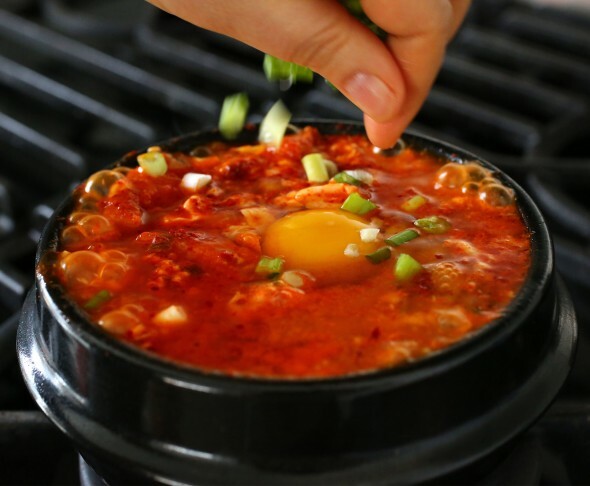 It is -21 degrees – that’s air temp – and -55 windchill here in Chicago right now and I decided that the only acceptable meal to eat on a day like this is Maangchi’s soon dubu jigae. Can you see the steam? I subbed mushrooms for the pork belly and it was delightful. I actually almost sweat a little! Thank you Maangchi! Posted October 25th, 2018 at 6:47 am | Log in to reply. Posted October 28th, 2018 at 10:01 am | Log in to reply. Yes, it looks so good! I haven’t made my sundubu-jjigae for a while, and your picture makes my mouth water! I’m encouraged by my readers like you. : ) Happy cooking! Posted October 29th, 2018 at 6:58 am | Log in to reply. I’m almost blushing as I read your answer :) I really take fun and pleasure in cooking your Korean recipes. More to come. Thank you Maangchi ! Posted September 4th, 2018 at 7:07 am | Log in to reply. Tried this today. Used lean pork leg instead of pork belly. I like it! Posted September 5th, 2018 at 9:31 am | Log in to reply. Not only the stew looks so tasty but the rice is well made! You don’t need anything else to finish the meal. Great photo, too! Posted July 20th, 2018 at 10:51 pm | Log in to reply. So yummy!!!!!! Definitely will make again. Posted July 3rd, 2018 at 3:51 am | Log in to reply. I’m in love with this dish. Last time when I went to Seoul my friend’s mother made this dish. I wanted to cook this dish here in Sri Lanka. And I found your blog when I was searching the recipe. couldn’t find the Kimchi and Soft Tofu though here in Sri Lanka. Yet I have tried with the Tofu available in the local market. It’s delicious. Posted May 18th, 2018 at 5:27 pm | Log in to reply. Posted January 17th, 2018 at 12:22 am | Log in to reply. My favorite Korean dish. Pork belly tends to be tough and chewy so I use ground pork instead. Anchovy stock is a must. I don’t like to add shitake because I don’t like the texture of boiled mushrooms. And I can’t imagine this dish without very sour kimchi. Can’t find tofu in a tube but I have learned that soft tofu works best (not silken). Posted November 15th, 2017 at 7:09 am | Log in to reply. Posted March 14th, 2019 at 8:55 pm | Log in to reply. 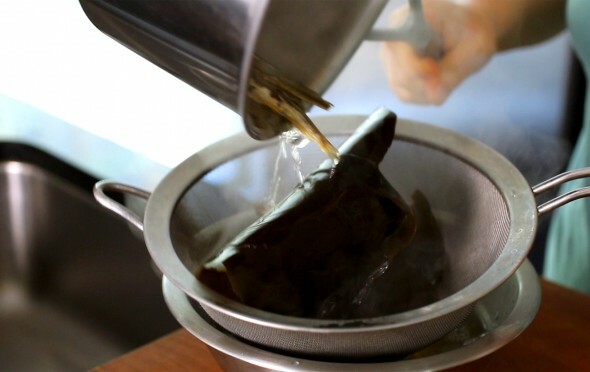 This recipe was originally posted on January 26, 2015 at 12:46 pm by Maangchi. It was last updated on September 29, 2017. The video was watched 2,311,908 times on YouTube & has 25,552 likes!